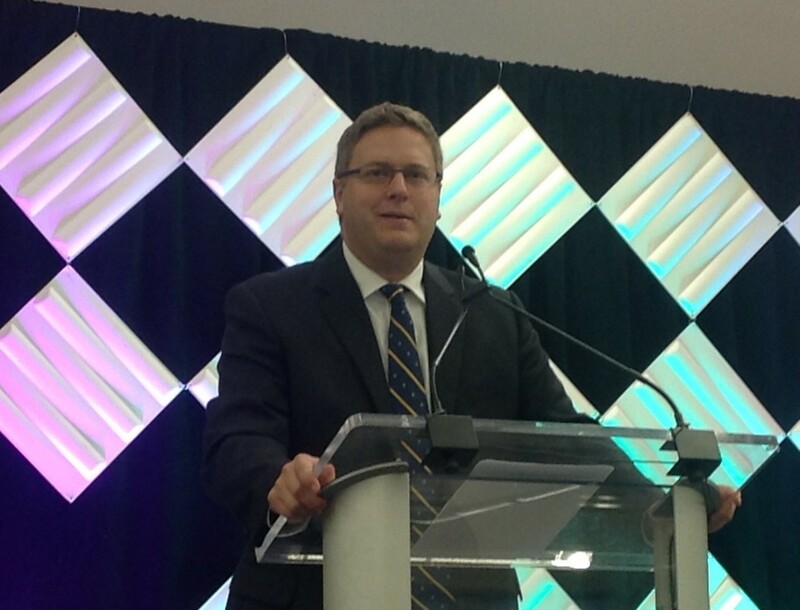 The state of Indiana’s chief innovation officer, Ian Steff, speaks Thursday during the second day of 2016 Innovation Crossover conference at the Bloomington/Monroe County Convention Center. Steff also serves as project adviser for the Applied Research Institute, a collaborative facility funded by a $16.2 million startup grant from the Lilly Foundation Inc. that will bring together military, university and industry partners. For now, development of an Applied Research Institute in southwest central Indiana is in its early stages, as military, academic and industry partners lay the groundwork for the collaborative facility funded by a $16.2 million grant from Lilly Endowment Inc.
Once it is up and running, however, the institute’s ambitions are not to be just another run-of-the-mill research center – nor does it plan to merely replicate the success of other collaborative research efforts in cities such as Dayton, Ohio; Huntsville, Ala.; Knoxville, Tenn.; or Raleigh, N.C.
Steff, who also serves as the state of Indiana’s chief innovation officer and senior adviser for nanotechnology and advanced manufacturing, was one of two keynote speakers featured during the conference’s second day at the Bloomington/Monroe County Convention Center. At least 230 people attended the conference’s opening day, with about 300 people signing up for the event. The other was Walter Jones, executive director of the Office of Naval Research. Both gave general overviews of their respective organizations and how each stands poised to work with academic partners such as Indiana University, as well as industrial partners such as Eli Lilly & Co., Rolls-Royce Corp., Cook Group Inc., and General Electric Aviation among others. As the science and technology provider for the U.S. Navy and Marine Corps, the Office of Naval Research – a parent organization of NSWC Crane – collaborates with more than 1,000 partners and employs more than 4,000 people at 23 locations and five field offices, including one in Chicago, Jones said. With an annual budget of about $3 billion, the office’s mission pivots on three key words – discover, develop and deliver. Walter Jones, executive director of the Office of Naval Research, gave an overview of U.S. Navy and Marine Corps’ research priorities Thursday during 2016 Innovation Crossover, a two-day conference sponsored by Naval Surface Warfare Center Crane. “We discover new knowledge by funding basic research, we develop those ideas and put them into systems that may one day find their way into the Navy and we deliver those products with the ultimate goal of providing a technological advantage for the Navy and the Marine Corps,” Jones said. To achieve those ends, ONR works to balance a “portfolio” of near-term, mid-term and long-term investments in potential defense systems, Jones said. About half of those projects are basic discovery and innovation, with timelines of 5 to 20 years or more for potential entry into service. The next largest block, about 30 percent of ONR projects, are “technology pull” items, which typically require 2-4 years of development. “Those are projects where the customer asks: ‘Can you do this for me,’” Jones said. The third largest block – about 12 percent of ONR’s portfolio – is known as “technology push” projects, which take about 4 to 8 years before possible deployment. High-priority technologies for the Navy and Marines include directed-energy weapons such as lasers and rail guns; cybersecurity and cyberwarfare; electromagnetic warfare; unmanned aerial, undersea and surface systems; and synthetic biology – a relatively new regime that includes environmental surveillance, warfighter enhancement and microbial electronics. “Synthetic biology is really in its infancy – a lot of areas where we’re just beginning to scratch the surface,” Jones said. Presidential Early Career Award for Scientists and Engineers (PECASE): Honors and supports extraordinary achievements of young professionals at the outset of their independent research careers in science and technology. 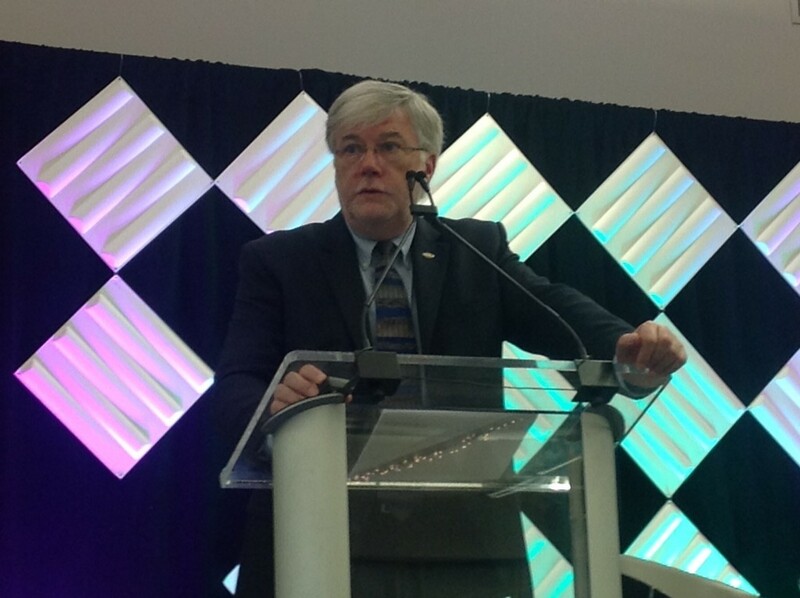 Having served on faculties at the University of Florida, University of Tennessee and Clemson University, Jones said he has an appreciation of “sticking points” that can emerge between government and academia, yet feels confident that the Applied Research Institute can realize success. “These areas have picked up momentum quickly and there has been so much convergence in research already that the lines are becoming non-distinct. Yet nobody has a monopoly in any of these areas,” Steff said. 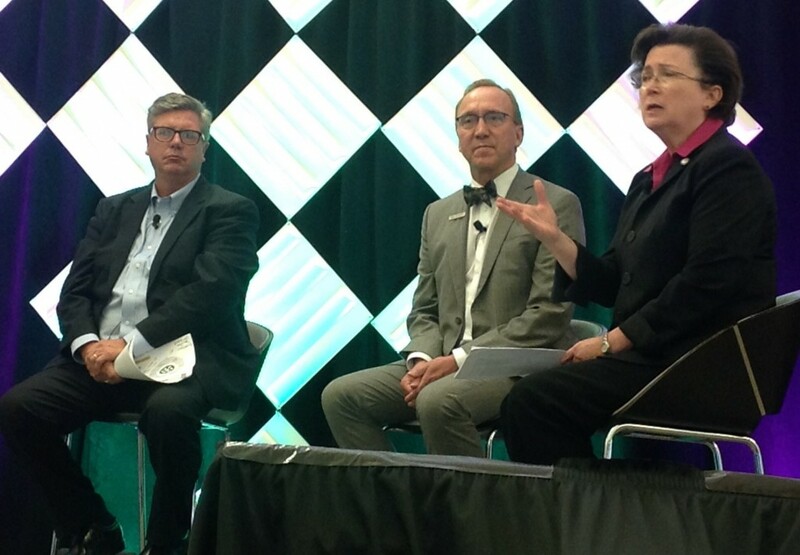 (L-R) Dan Hasler, president and CEO of the Purdue Research Foundation; Brad Wheeler, chief information officer and vice president of information technology for Indiana University; and Linda Bennett, president of the University of Southern Indiana, take part in a Thursday panel discussion at the 2016 Innovation Crossover conference. So far as its academic partners are concerned, the Applied Research Institute already shows signs of becoming a transformative force, according to a panel of representatives from Indiana University, Purdue University and the University of Southern Indiana. Unlike cultures seen in many other states, Indiana seems to lack many barriers that often prevent such collaboration between institutions of higher learning, said Linda Bennett, president of the University of Southern Indiana. “There are not many states where you would three institutions such as ours, sitting up here on the same stage, eagerly looking forward to working together,” Bennett said. Brad Wheeler, chief information officer and vice president of information technology for Indiana University, echoed such sentiments. Along with its economic prospects, the Applied Research Institute could also — over time — serve as an example for how future collaborations are achieved, said Dan Hasler, president and CEO of the Purdue Research Foundation.